Nine of the strings of numbers designated as “gold” numbers by the NBTC were sold for: 09-8888-8888 for THB8.1 million, 06-5555-5555 for THB6.9 million, 09-5555-5555 for THB6.9 million and 09-7777-7777 for THB6.1 million. Five more numbers that got winning bids in the THB6 million range were: 09-0000-0000, 09-1111-1111, 09-4444-4444, 09-6666-6666 and 06-1111-1111, reported Thai PBS. There were 10 bidders participating in the auction. The two shining stars in the NBTC auction were two ultra-premium numbers, 09-9999-9999 and 08-8888-8888, that the organization wanted THB20 million each for. They opened the bidding but these numbers were apparently priced too high and no one bid on them. 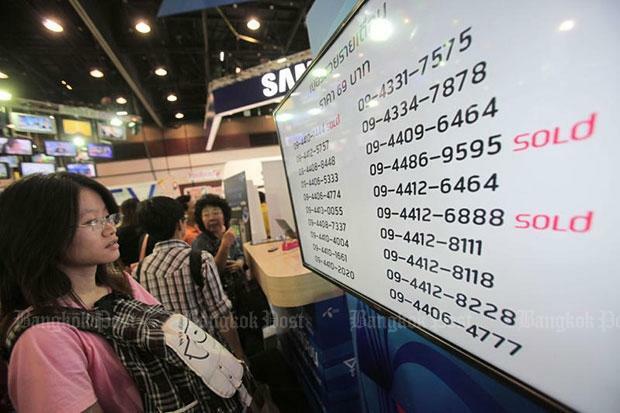 The numbers that were not won will be up for auction in the next auction, which will be held in April or March of next year, reported Bangkok Post.